I pushed through a rough spot in the studio yesterday (not least because I forgot my headphones and had to paint through other people’s music and conversations). I have been struggling with the Pieta painting and how I want to make objects in the alleyway fade in and out of distinction. I want the figures themselves, especially the Mother figure to be more classical Renaissance in style, eternal-feeling, more real than the surroundings, but the alley/background needs to be less distinct. It could be blended and fogged, faded, abstract… there are so many ways to go. Yesterday I had a lot of pent-up, agitated energy. I almost didn’t paint, but then I felt that it was exactly the energy that should go into the background. As I started to paint the supporting objects for the figure (a tent-bag, folded blankets, a roll of foam, cardboard sheets) I found myself drawn to a larger brush than usual and went with it. Bold strokes came out and I found myself loving the space behind them showing the underpainting. It’s hard to leave those raw marks and not fuss over them. There is a tendency towards smoothing things out and making them more representational if you know how (something I see when I’m tutoring or teaching a class all the time). 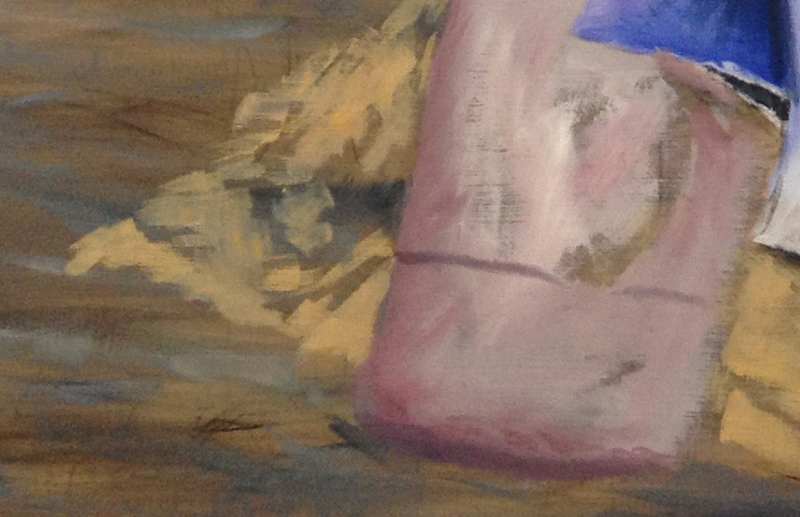 …but when I look at other paintings, those rough ones are the marks I love best. I think this is my answer. I’m going to rough it all in in this style, leaving gaps to the under-painting and then pick out tiny portions of objects to add detail to. I want a little of that dream-feeling that objects only gain detail when you look at them closely and become indistinct otherwise. I want it to feel in-motion, impermanent, to highlight the rock that is the mother-figure. I think the “child” figure will have aspects of both. The whole experience was a uncomfortable and unbalancing, but also refreshing in a way. It’s a sign of growth- we can’t learn new things when we stay in our comfort zone at all times, and I intend to keep learning. The painting I find most sublime is when someone can play surprising elements against each other: rough against smooth, figurative against abstract, digital against organic. It goes with the obsession with liminality and paradox.